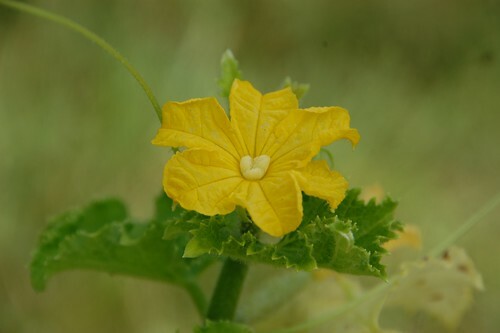 This is actually a cucumber flower but I'm not at all sure I even took a picture of the melon in flower. I certainly wasn't expecting the fruit when it finally happened, one day there seemed to be nothing and then there it was like a golf ball. Anyway, the cucumber flower is a close cousin and really rather lovely so I don't feel bad about using it as a stand in. 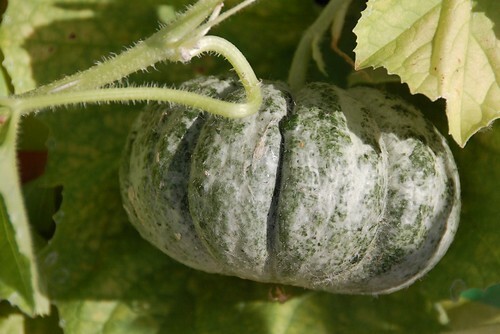 The melon itself managed to reach about 20cm in diameter and then just sat there, neither getting bigger nor ripening as far as I could see and each day the vine seemed more yellow and less likely to be able to support any further growth or sadly, any more melons. So I picked off the solitary fruit and took it into the kitchen where it has been decorating the counter for a couple of weeks. Today I realised the green and knobbly skin had turned quite yellow, the fruit seemed softer and it smelled delicious so without further ado, reader, I ate it. 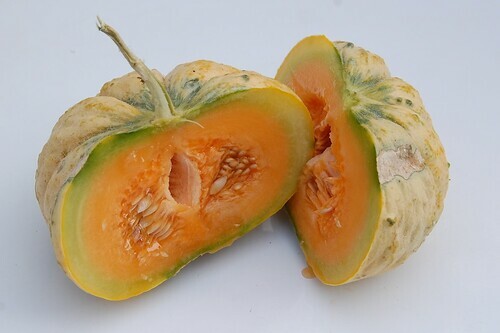 Very nice too, the skin is a little thicker than the fancy Galia or Ogen melons found in all good French supermarkets all summer but the flesh is sweet, orange and very juicy. I'll be saving the seeds for another go next year but you can buy some from Realseeds.